There are 577 députés, each elected by a single-member constituency through a two-round voting system. Thus, 289 seats are required for a majority. The assembly is presided over by a president (currently Claude Bartolone), normally from the largest party represented, assisted by vice-presidents from across the represented political spectrum. The term of the National Assembly is five years; however, the President of the Republic may dissolve the Assembly (thereby calling for new elections) unless he has dissolved it in the preceding twelve months. This measure is becoming rarer since the 2000 referendum reduced the presidential term from seven to five years: a President usually has a majority elected in the Assembly two months after him, and it would be useless for him to dissolve it for those reasons. Following a tradition started by the first National Assembly during the French Revolution, the "left-wing" parties sit to the left as seen from the president's seat, and the "right-wing" parties sit to the right, and the seating arrangement thus directly indicates the political spectrum as represented in the Assembly. The official seat of the National Assembly is the Palais Bourbon on the banks of the river Seine (48°51′43″N 2°19′07″E﻿ / ﻿48.861899°N 2.318605°E﻿ / 48.861899; 2.318605); the Assembly also uses other neighbouring buildings, including the Immeuble Chaban-Delmas on the rue de l'Université (48°51′39″N 2°18′57″E﻿ / ﻿48.860799°N 2.315902°E﻿ / 48.860799; 2.315902). It is guarded by Republican Guards. Jacques Chaban-Delmas was three times President of the Assembly between 1958 and 1988. The National Assembly can overthrow the executive government (that is, the Prime Minister and other ministers) by a vote of no confidence (motion de censure). For this reason, the prime minister and his cabinet are necessarily from the dominant party or coalition in the assembly. In the case of a president and assembly from opposing parties, this leads to the situation known as cohabitation; this situation, which has occurred three times (twice under Mitterrand, once under Chirac), is likely to be rarer now that presidential and assembly terms are the same length. While motions de censure are periodically proposed by the opposition following government actions that it deems highly inappropriate, they are purely rhetorical; party discipline ensures that, throughout a parliamentary term, the government is never overthrown by the Assembly. Since the beginning of the Fifth Republic, there has only been one single successful motion de censure, in 1962 in hostility to the referendum on the method of election of the President, and president Charles de Gaulle dissolved the Assembly within a few days. The Palais Bourbon, where the National Assembly meets. Since 1988, the 577 deputies are elected by direct universal suffrage with a two-round system by constituency, for a five-year mandate, subject to dissolution. The constituencies each have approximately 100,000 inhabitants. The electoral law of 1986 specifies that variations of population between constituencies should not, in any case, lead to a constituency exceeding more than 20% the average population of the constituencies of the département. However, districts were not redrawn between 1982 and 2009. As a result of population movements over that period, there were inequalities between the less populous rural districts and the urban districts. For example, the deputy for the most populous constituency, in the department of Val-d'Oise, represented 188,000 voters, while the deputy for the least populous constituency, in the department of Lozère, represented only 34,000. The constituencies were redrawn in 2009, but this redistribution was controversial. Among other controversial measures, it created eleven constituencies and seats for French residents overseas, albeit without increasing the overall number of seats beyond 577. Assembly members receive a salary of €7,043.69 per month (US$10,389.49). There is also the "compensation representing official expenses" ("IRFM" – indemnité représentative de frais de mandat) of €5,867,39 per month (US$8,654.44) to pay costs related to the office, and finally a total of €8,949 per month (US$11,884) to pay up to five employees. They also have an office in the Assembly, various advantages in terms of transport and communications, social security, a pension fund and unemployment insurance specific. Under Article 26 of the Constitution, deputies, like Senators, are protected by parliamentary immunity. In the case of an accumulation of mandates, a member cannot receive a wage of more than €9,779.11 (US$14,424.25). 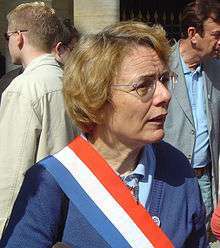 Since 1958, the position of member of the National Assembly is incompatible with that of any other elected member (Senator or Member of European Parliament), or with some administrative functions (members of the Constitutional Council of France and senior officials such as prefects, magistrates or officers who are ineligible for Department where they are stationed). Members may not have more than one local mandate (in a municipal, intercommunal, general or regional council) in addition to their current mandate. The mandate is also incompatible with a ministerial function. Upon appointment to the Government, the elected member has one month to choose between the mandate and the office. If he or she chooses the second option, then they are replaced by their substitute. To be eligible to be elected to the National Assembly, one must be at least 23 years old, of French citizenship, and not subject to a sentence of deprivation of civil rights or to personal bankruptcy. Fifteen seats in the assembly are necessary to be able to form a group. ↑ La motion de censure : véritable moyen de contrôle ?